Posted on 26th April 2018 at 15:07. At Search and More, we speak a lot of SEO (search engine optimisation) jargon. One of the terms that pops up a lot in our blogs is PPC campaigns. Though many may have a general understanding of what this is, this week we are going back to basics for those who may appreciate an introduction. 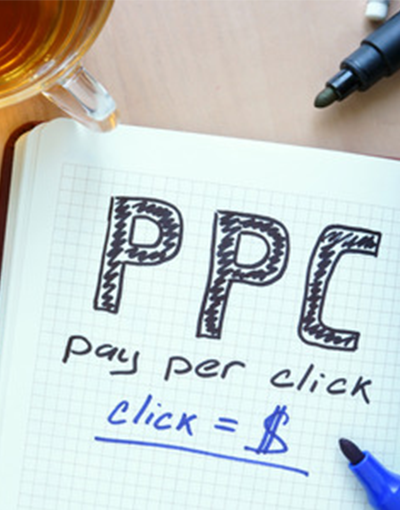 PPC stands for pay-per-click, a model of internet marketing where advertisers pay a fee each time one of their advertisements has been clicked on by a user. As opposed to bringing in organic growth, it buys visitors to your site. Don’t be put off by this, however, PPC campaigns are an efficient approach to increasing traffic. Search engine advertising gives advertisers the opportunity to bid for advertising space in a search engines sponsored links when a user searches for a keyword that is relevant to what they are offering. So, if we were to search “SEO company Stockport”, our name may pop up on the top of Google results page. Each time our advert is clicked and sends a user to our website, we must pay a small fee to Google. When PPC is working as it should, the visit is worth more than what you are paying for that one click. In order words, if we pay £1 for a click, but that click results in a sale, that is a wonderful return on investment. This is something you should be aiming for to help your business succeed. A lot goes into building a successful PPC campaign: from researching and deciding on the best keywords, to forming those keywords into groups, to setting up landing pages for your PPC campaigns. If your ad is relevant and well targeted, your PPC will cost less. If your ad is useful and satisfying to users, Google will charge you less per click, meaning more profit for your business. Google AdWords is the most popular PPC advertising system in the world. This platform enables businesses to make ads for Google’s search engine and other Google properties. AdWords operates on a PPC model where users bid on keywords and pay for each click on their ads. Each time a search is initiated, google chooses a set of winners from the AdWords pool of advertisers. These winners will see their ads posted on valuable ad space on Google’s search results page. How are these winners chosen? It is based on a mix of factors, including the quality and relevance of their keyword choices and ad campaigns, as well as the size of their keyword bids. More specifically, the choice of who appears on the page is based on an advertisers Ad Rank. This is a metric that is calculated by multiplying the CPC bid (the most an advertiser is willing to spend) and quality score (a value based on your click-through rate, relevance and quality of landing page). This system allows the winning advertisers to reach potential customers at a cost that fits their budget. It is especially valuable for you to conduct PPC marketing through AdWords because Goggle gets a lot of traffic, delivering the most impressions and clicks to your ads. The frequency of your PPC ads appearing depends on your choice of keywords and match types. Researching keywords for your PPC campaign can be extremely time-consuming, but it is very important. Your entire PPC campaign is built around keywords, and the most successful PPC campaigns are continuously refined and developed by keyword search. If you only research your keywords when you create your first PPC campaign, changes are you’re missing out on thousands of valuable, low-cost and highly relevant keywords that could bring traffic to your site. Once your PPC campaigns have been created, managing them on a regular basis is key to knowing how effective they are. In fact, regular activity on your account is one of the best ways to predict the success of your account. You need to be analysing the performance of your account on a regular basis and make the following changes to optimise your campaigns. Add PPC keywords – Adding keywords that that are relevant to your business can help expand the reach of your PPC campaigns. Add negative keywords – By adding non-converting terms as negative keywords will improve the relevancy of your campaigns and reduce wasted spends. Split your ad groups – Doing so will improve your click-through rate and Quality Score. Review costly PPC keywords – Shut off those that are not necessary. Refine landing pages – It’s important to keep modifying the content and calls to action of landing pages to align with individual search queries to boost conversion rates. It’s important to send your traffic to more than one page. To find out more about services from Search & More, get in touch today to see how we can help.